The US Secretary of State, Condoleezza Rice, has said Turkey and the United States share a common enemy in the Kurdistan Workers' Party (PKK). Ms Rice said the fight against the Kurdish separatist rebels would require persistence and commitment, after talks with the Turkish government in Ankara. The meeting was aimed at averting major military operations by Turkey against PKK fighters based in northern Iraq. Turkey has threatened to send in troops if it does not see any concrete action. Nearly 50 Turkish soldiers have died in clashes with Kurdish fighters in the last month and the government is under huge public pressure to respond with force. Speaking at a news conference after talks with the Turkish president, prime minister and foreign minister, Ms Rice said the US was committed to redoubling its efforts to eliminate the threat to Turkey from the PKK. "I affirmed to the prime minister as well as to the foreign minister that the United States considers the PKK a terrorist organisation and indeed that we have a common enemy, that we must find ways to take effective action so that Turkey will not suffer from terrorist attacks," she said. "That is destabilising for Iraq, it's a problem therefore of security for the United States and Turkey and we will work together to achieve our goals," she added. "This is going to take persistence and it is going to take commitment. This is a very difficult problem... Rooting out terrorism is hard." Turkey's Foreign Minister, Ali Babacan, said Ms Rice's visit marked the start of close co-operation between the Nato allies. "This is where the words end and action needs to start," he said. Ms Rice gave little detail of any concrete steps the US planned to take, but said current activities, such as the sharing of intelligence, would be enhanced and referred to a "comprehensive approach" that is currently being discussed. She also underlined that any steps taken by Turkey, whether military or otherwise, had to be effective and reinforce the goal of a stable and secure Iraq on Turkey's border. The BBC's Sarah Rainsford in Ankara says Ms Rice's visit will set the tone for a meeting between the Turkish Prime Minister, Recep Tayyip Erdogan, and US President George W Bush on Monday in Washington. On Wednesday, the Turkish government announced it had begun to implement new military, political, diplomatic and economic measures to combat the PKK. Although no details were given about the economic measures, correspondents say they may result in a boycott of the semi-autonomous Kurdistan Regional Government in northern Iraq, which Ankara says is failing to rein in the activities of the PKK. The move came after Iraq pledged to step up checkpoint security in an effort to deny the movement of the PKK and cut off its supply lines. The US also said it had stepped up its supply of "actionable intelligence" to the Turkish military to help it locate PKK positions in northern Iraq. 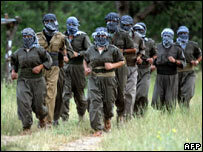 Turkish officials are demanding the closure of PKK camps in Iraq and want the group's leaders arrested. Ms Rice says the Kurdish President, Masoud Barzani, has pledged to disassociate his administration from the PKK - but Turkey remains sceptical. "We have doubts about the sincerity of the administration in northern Iraq in the struggle against the terrorist organisation," the Associated Press quoted Turkey's foreign minister as saying. However, any military operation would target PKK bases, and would not be a general invasion, Mr Babacan added.